Heineken is king among alcoholic beverage brands when it comes to its social media and offline or word-of-mouth (WOM) impact, according to a new ranking from Engagement Labs. The ranking is based on the company’s proprietary TotalSocial data, derived from continuous tracking and measurement of the key online and offline drivers of conversations about brands. Those drivers include not just the volume of conversations, but the quality of the sentiments expressed. The data for the 12 months ending in March show these brands making up the top 10 (in order): Heineken, Jack Daniels, Budweiser, Bud Light, Corona, Smirnoff, Coors Light, Miller Lite, Bacardi, and Grey Goose. Although some other brands, including Budweiser and Bud Light, had higher conversation volumes, Heineken was the only alcoholic beverage brand among the 500 studied that performed above average both online and offline — making it a “conversation commander,” in Engagement Labs’ terminology. That reflects Heineken’s extremely strong, positive sentiment scores both online and off, due in large part to its successful ad campaigns. 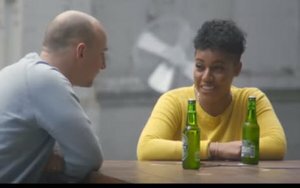 One prime example: its recent, much-praised “Worlds Apart” long-form video, from Publicis London, showing how people who espouse opposing views on controversial topics can find common ground if they interact and listen with open minds (and share a Heineken). The video has generated nearly 13 million views on the brand’s YouTube channel since it was posted on April 20. As a whole, the alcoholic beverages category is dominated by brands that perform lower than average on these scores both online and off, although they tend to do slightly better in face-to-face conversations. The rankings — with beer brands taking six of the top 10 slots —also reflect consumers’ tendency to talk more about beer than spirits brands. And that, in turn, speaks to major beer brands’ significant investments in “talk worthy” creative and ample media to ensure audience exposure, says Ed Keller, CEO of Engagement Labs. Jack Daniels, the only spirits brand in the top five, generally performs better in offline conversations than in social media channels. However, it’s clearly been working on upping its social buzz quotient. To mark its 150th-anniversary last year, Jack Daniels staged a global barrel hunt and offered videos starring real residents from its unique hometown, Lynchburg, Tenn., among other socially-driven efforts. It also offered “pop-up distillery experiences” in select markets, and numerous collectible products and other surprises. Fifth-ranked Corona had one of the largest discrepancies between offline and online scores among the 500 brands measured, with a top offline score but weak online score, according to the report. Engagement Labs, which dubs brands with big gaps between online and offline performance “social misfits,” stresses that they need to apply what works in their strong channel to their weaker channel.